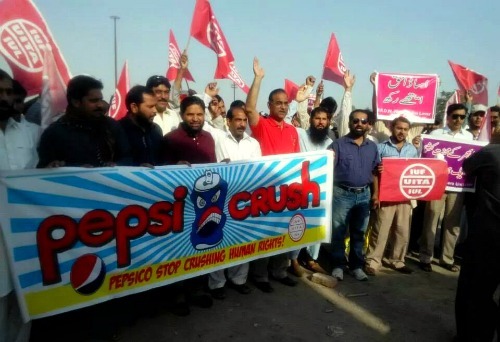 Workers in Pakistan call on PepsiCo to stop crushing human rights! The IUF-affiliated Pakistan Food Workers Federation has shown solidarity with PepsiCo warehouse workers in India and organized a demonstration at Karachi in front of Pakistan Beverage Limited,a PepsiCo franchise company. Members of Pakistan Food Workers Federation who joined the May Day celebrations in Lahore, Karachi, Multan and Rahim Yar Khan called on PepsiCo management to stop crushing human rights. PepsiCo Warehouse workers in India were brutally fired in 2013 and they are still fighting for reinstatement at their jobs with full back pay and full guarantees that they can form or join a union without fear of reprisal.